The team of mountain bike races from The Construction Zone Ltd. dominated at this year’s Specialized Cactus Cup, held March 8-10 (submitted photo). You wouldn’t normally associate a team of general contractors with cycling dominators, but that’s just what you get with the Construction Zone. Construction Zone Ltd., 1729 E. Osborn Road, is a general contractor that does both commercial and residential builds with a modern aesthetic. 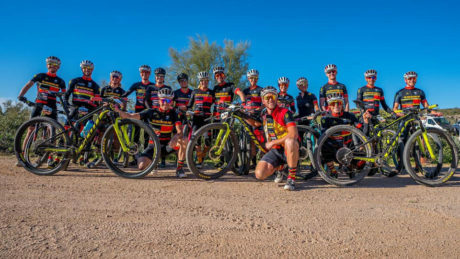 The company fielded its own racing team, CZ Racing, during last month’s Specialized Cactus Cup Mountain Bike Stage Race, held March 8-10 at McDowell Mountain Regional Park in Fountain Hills. The Cactus Cup, held March 8-10, included three races for professionals, amateurs, and juniors. Races included a Short Track, XC (40 miles), and Enduro event. To chase the Cactus Cup and capture the overall title, all three days of the event had to be completed. CZ Racing walked home with several awards, including the First Overall, Elite Division, for both the men’s and women’s groups. Fernando Riveros Paez posted several impressive times to capture First Overall, Elite Men’s, including a First Place in the XC 40 mile on Friday; First Place in the Elite Short Track on Saturday; and Second Place in the Fat Tire 40 mile on Saturday. He took Third Place in the Enduro race on Sunday. Erin Huck also dominated in the Elite Women’s group, capturing First Place in Short Track on Friday; first place in the XC 40 mile on Friday; First Place in the Elite Short Track on Saturday; and First Place in the Fat Tire 40 Mile, also on Saturday. Huck came in second in Sunday’s Enduro race. CZ Racing’s Wes Rasmussen captured First Overall, Amateur Male in the 19-34 age bracket, while Shawna Glazier took First Overall, Amateur Female in the 19-39 age bracket. Over 1,200 bikers from across Arizona and the Southwest competed over the three days. Founded in 1991 and revived in 2017 by Hub Events, the Specialized Cactus Cup brings professional and amateur mountain bikers and their families together for a weekend of competition and fun, while encouraging a new generation of enthusiasts through the addition of kids’ races and activities. A prize purse of $5,000 was distributed among the top five elite male and female finishers of the Cactus Cup, and the top elite male and female finishers of the short track. Unlike other races, competitors do not need to be qualified professionals to register for the elite races. The Cactus Cup supports a number of local nonprofit organizations including: Gravity Riders of Arizona, Mountain Bike Association (MBAA) and the Central Arizona Mountain Bike Patrol. The support includes financial, co-promotions and volunteering throughout the year. Projects include trail maintenance, adding features to terrain parks and trail user (bikes, hikers and horses) sustainability. For more information visit https://thecactuscup.com.